To improve usability I have removed the notion of an "active part list", and have also changed how saved and completed builds are updated. Starting now, any changes made to a part list will not automatically update a saved or completed build. Instead, to update a saved or completed build, use the part list "Save As" button and select the build you would like to update. You can also save your part list to a new saved or completed build. Before this update, you could switch the active part list to a previously saved or completed build. Then any changes made would be automatically be reflected in your saved or completed build. In retrospect this was not a good design decision. I tried to make the currently active part list obvious, but in the end no matter what I did I couldn't make it visible enough. Changes to saved and completed builds were made accidentally because it wasn't clear that they were the active part list. I received a lot of feedback to this effect, so I sought out to fix things. To remedy this problem, I reverted the part list editing behavior to be similar to how to it was prior to the previous changes. Changes made to a part list no longer automatically update a saved or completed build. Now if you want to update a previously saved or completed build, you can use the "Save As" button to either select a build and overwrite it, or create an entirely new saved/completed build. This will hopefully prevent accidental changes to saved and completed builds. I apologize to anyone affected aversely by the previous strategy, and I appreciate your patience with me and the site as I find the best approach. I hope that this new system is safer, and in the end, more usable. As always, if you have feedback or suggestions, definitely let me know. src="//cdn.pcpartpicker.com/static/forever/images/blog/galaxy_gtx660ti_thumb.jpg" /> "Today marks the release of NVIDIA's latest Kepler-based graphics card, the GeForce GTX 660 Ti. This long rumored GPU is probably not full of any surprises any more with all the leaks surrounding it, but that doesn't mean the card offers any less performance or value. Priced at $299, $100 less than its GTX 670 cousin, the GTX 660 Ti has ALMOST the same specifications: 1344 CUDA cores, 2GB of frame buffer running at 6.0 GHz, GPU Boost capability; but it does move from a 256-bit memory controller to a 192-bit controller resulting in a performance hit of about 15% in many games. The upside for the GeForce GTX 660 Ti is that it competes strongly with the Radeon HD 7950 3GB cards that will run you at least $50 more. And yes, this 7950 was even tested with the new "Boost enabling" BIOS. Not only that, gamers that purchase the GeForce GTX 660 Ti will get a free copy of Borderlands 2 which is going to be a terrific title. If you want the full review of the GeForce GTX 660 Ti be sure to check out my write up and comprehensive benchmark collection over at PC Perspective (pcper.com) and stop by the video card section to see if the GTX 660 Ti is right for you!" More sound cards and prices will be added as time progresses. Enjoy! Easily browse completed builds -- Now you can easily browse users completed builds, with filters for CPU, GPU, Case, etc. A Reddit Markup button (like with part lists) that will format your completed build with part list, links to the pictures, your description, as well as any specifications/temperatures/benchmark results you added. As the markup language is the same as reddit, all your description text formatting will carry over automatically when posting your build complete message on /r/buildapc. Voting and commenting - vote completed builds up/down, leave comments, etc. Ability to document your overclocking amount, temperatures, 3DMark score, etc. Like completed builds, your saved builds can now be edited/changed. (Coming soon) The ability to annotate saved builds with notes. Reddit-style comments are live on the site. All completed builds and part pages can now be commented on. Like on Reddit, if someone replies to one of your comments, you'll see a blue envelope with the "inbox" count next to your username in the header. Same applies if someone comments on your completed build. (Coming soon, like hopefully later today) If you have a completed build, it'll show up as a badge next to your username on your comments. 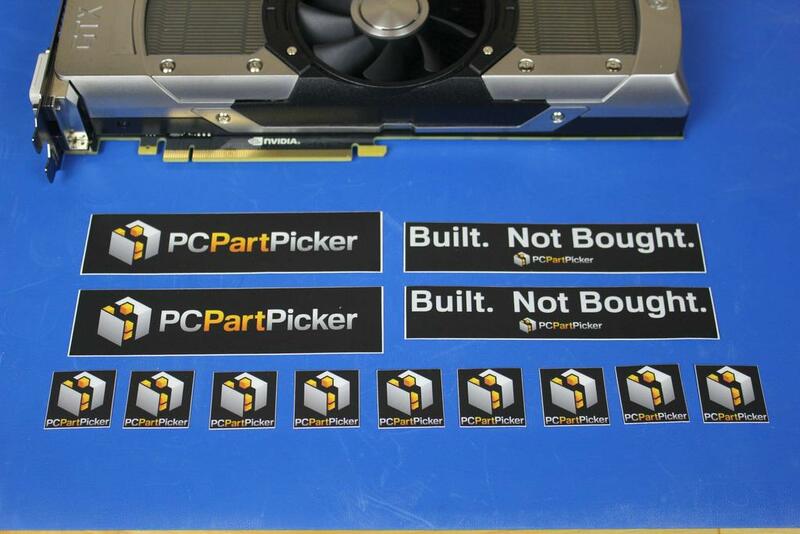 I will happily send them to you for free (including internationally), or you can buy them from the new PCPartPicker store. The benefit to buying them instead of for free is that, like the T-shirts, 100% of the proceeds go to benefit Charity:Water. Mark parts as owned so that their prices are not counted toward your part list total. I have many more changes on the way. I'm just coming to the end of week four of doing this full-time, so there are many suggestions I'm still trying to get worked into the site. Thanks so much for all the feedback so far!